Peer-to-peer lending company Prosper reached a benchmark $100 million in loan volume this week. With the US stock market declines, credit crunch, raising gas prices and ailing economy, borrowers are turning to novel forms of credit such as fledgling peer-to-peer capital platforms offered by Prosper (US), Lending Club (US) and Zopa (UK). $100 million in loan volume is an important benchmark, however the overall growth rate of new Prosper loans is slowing as the chart below indicates. 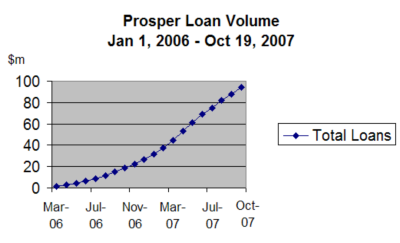 Prosper's loan volume grew from essentially zero at the beginning of 2006 to $100 million in November 2007 but the S-curve inflected earlier this year at the $50 million loan volume mark. The reason that Prosper loan growth is slowing is the same subprime credit challenge facing large financial institutions and the US economy as a whole. Initially, high interest rates attracted individuals willing to lend to subprime borrowers to the Prosper platform, but many of them have experienced high default rates and withdrawn their capital or curtailed their lending strategies. 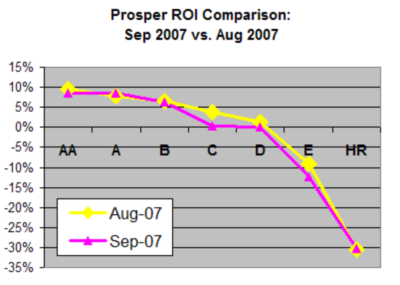 Below is Prosper's ROI by credit tier, comparing the annual return for the year ending September 30, 2007 with the year ending August 31, 2007. Negative returns can be expected for credit tiers D, E and HR (high risk), while even the C tier has now slipped to a zero ROI. Prosper continues to be exclusively appropriate for investing in high credit quality, tiers AA, A and B, where the 6-9% ROI is still attractive relative to other investments, however perhaps becoming more risky.